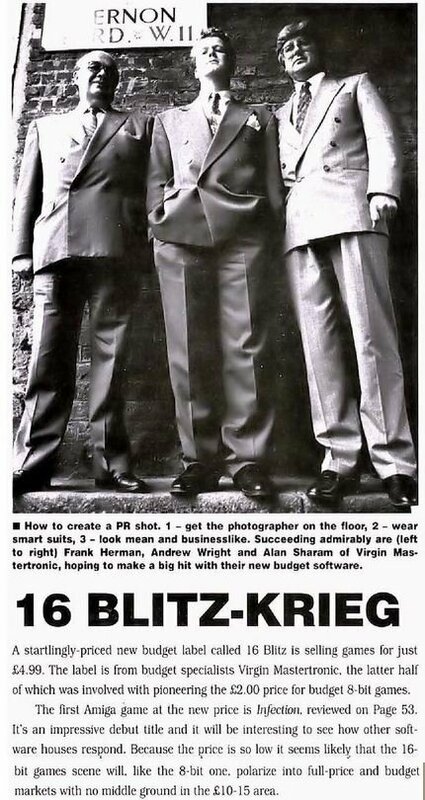 Wearing suits considerably smarter than they normally donned for a day at the office, budget manager Andrew Wright is flanked by Frank Herman and Alan Sharam outside our offices. The 16-blitz label was the first attempt to distinguish products for the Amiga, Atari ST and IBM PC ( & compatibles) computers from the rest. Whether it was well received in Germany is questionable. I would have thought that by this time everyone knew what Mastertronic's standard price point was, but apparently not Amiga Format who published this little puff in November 1989.